Hello, and welcome to the Week 14 Actual Opportunity report. This is our weekly look at the players with the most fantasy potential based on volume, and how effective they’ve been with it. If you’re unfamiliar with Actual Opportunity, you can read the in-depth explanation here. Over Jackson’s three missed games over the past two seasons, Mike Evans has averaged 18.1 expected and 12.0 actual fantasy points per game. That’s a 1.6-point bump in volume, but a 3.2-point loss in production against his full average over this span. Perhaps the lack of production can be explained by a greater focus from opposing defenses, or, perhaps it’s just variance from a small sample size, but 18.1 expected fantasy points per game would rank fourth-best at the position this year. In the four games Jackson or Evans has missed over the past two years, Chris Godwin averages 16.6 expected and 17.5 actual fantasy points per game. Across these four games, he’s also averaged 120.8 air yards, 8.5 targets, 1.3 end-zone targets, and 2.0 deep targets per game. Essentially, that’s good for low-end WR1 numbers. Adam Humphries ranks seventh among wide receivers in fantasy points since Week 8, averaging 17.1 fantasy points per game. 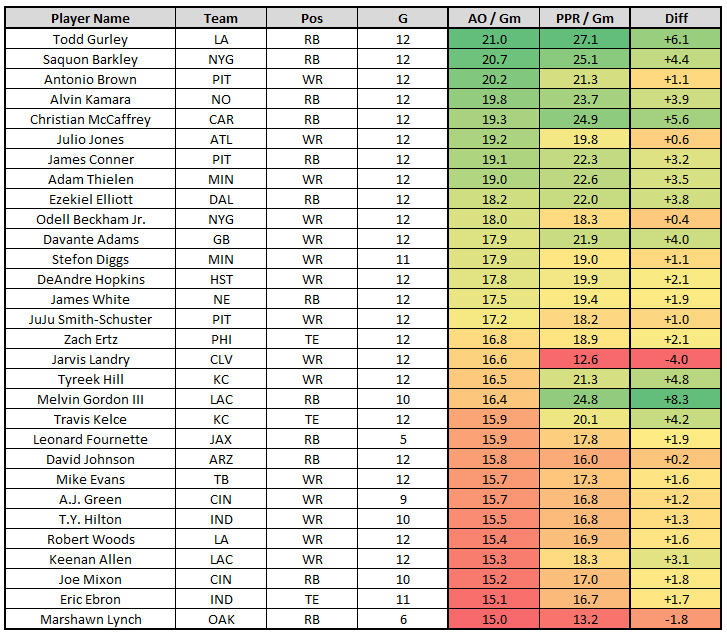 However, volume has not been as good, ranking 18th, and averaging 11.9 expected fantasy points per game. This implies a looming regression, and when forced to choose, I’m ranking Godwin (our 12th-highest-graded wide receiver) higher this week.